Recent release “Henry Rocks the 4th” from Page Publishing author Gregory Ross is a light-hearted, fun children’s story. Will Henry and the Counting farm animals survive in the big city? Gregory Ross, an accomplished author, has completed his newest book in The Counting Rooster series called “Henry Rocks the 4th”. It is an imaginative and adventurous story about farm animals that are invited to celebrate the fourth of July at the new San Francisco Zoo. What new friends will they make along the way? Greg is a young 45-year-old inspired author who loves to write children’s’ short stories that are full of love and great adventure. His childhood was based on his imagination to see other worlds. Greg’s grammar school teacher in the 5th grade was Greg’s inspiration to put his thoughts and his endless imagination on paper. That teacher gave Greg a way to show his creative side that brought him 37 years later to write his first children’s book “The Counting Rooster”. Greg’s prayers and love are with all people no matter what color or beliefs they have, he loves all and every living things and most of all he respects and loves our beautiful earth. Published by New York City-based Page Publishing, Gregory Ross’s captivating tale teaches the ideas of adventure and friendship, while also paying homage to the Fourth of July. 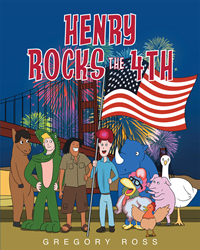 In “Henry Rocks the 4th” an amazing opportunity is presented to Billy and Henry, The Counting Rooster. The Mayor of San Francisco, California has extended an invitation to visit the city during the Fourth of July week. A new safari exhibit is about to be revealed at the San Francisco Zoo. What does Henry and the rest of the farm animals teach? Most importantly what do they learn when they meet the exotic zoo animals and Bruno, the infamous blue rhino. Readers who wish to experience this exciting work can purchase “Henry Rocks the 4th” at bookstores everywhere, or online at the Apple iTunes store, Amazon, Google Play or Barnes and Noble.